"I don't get it Tyrell, how can it not know what it is?" "I was quit when I came in here. I'm twice as quit now." "I'm Deckard. Blade Runner. Two sixty three-fifty four. I'm filed and monitored." "I've had people walk out on me before, but not when I was being so charming." "Memories, you're talking about memories." "One more question. You're watching a stage play. A banquet is in progress. The guests are enjoying an appetizer of raw oysters. The entree consists of boiled dog...". [The question on the Voight-Kampf test that Rachel "fails" when she gives no answer]. Batty: Yes! [smiles] Questions... Morphology? Longevity? Incept dates? Chew: Don't know, I don't know such stuff. I just do eyes, juh, juh... just eyes... just genetic design, just eyes. You Nexus, huh? I design your eyes. Batty: Chew, if only you could see what I have seen with your eyes. 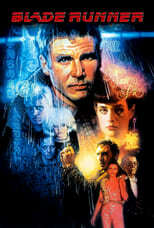 Deckard: Replicants are like any other machine: they're either a benefit or a hazard. If they're a benefit, it's not my problem. Tyrell: [Offscreen]Is this to be an empathy test? Tyrell: Capillary dilation of the so-called blush response...fluctuation of the pupil...involuntary dilation of the iris. Deckard: We call it Voight-Kampf for short. Rachael: Mr. Deckard, Dr. Elden Tyrell. Tyrell: Demonstrate it. I want to see it work. Tyrell: [Nods at Rachael] Try her. Roy: [taunting Deckard with a counting rhyme] Six! Seven! Go to Hell or go to Heaven! Roy: Good! That's the spirit! Tyrell: I'm surprised you didn't come here sooner. Roy: I had in mind something a little more radical. Roy: I want more life, ****er/father. Tyrell: The facts of life: To make an alteration in the evolvement of an organic life system is fatal. A coding sequence cannot be revised once its been established. Tyrell: Because by the second day of incubation, any cells that have undergone reversion mutations give rise to revertant colonies like rats leaving a sinking ship; then the ship sinks. Roy: What about EMS recombination? Roy: Then a repressor protein that blocks the operating cells. Tyrell: Wouldn't obstruct replication, but it does give rise to an error in replication so that the newly formed DNA strand carries a mutation and you've got a virus again. But this - all of this is academic. You were made as well as we could make you. Roy: Nothing the god of biomechanics wouldn't let you into heaven for. [Revealing to Rachael that her memories are fake, that the picture of her mother is fake and that of course, she's a Replicant] "You ever tell anyone that? Your mother, Tyrell? They're implants. Those aren't your memories, they're somebody else's. They're Tyrell's niece's. OK, bad joke, I'm sorry... No, really, I made a bad joke. Go home, you're not a Replicant... (sigh) you wanna drink? I'll get you a drink."